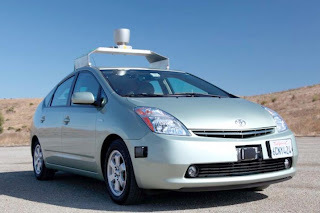 Maybe I've mentioned my ongoing bet with husband: he's convinced we won't see mainstream adoption of driverless cars in our lifetime, and I'm certain we will. This week I'm just a little closer to winning that bet, as Nevada finalizes rules allowing driving permits for robotic cars. "We were driving behind an 18-wheeler and we saw the vehicles in front of the 18-wheeler — vehicles we could not see with our eye — because the signal bounced off the pavement ... at a glancing angle underneath the 18-wheeler. And so no human will ever have the amount of information that these cars have when they are driving." Of course, we're still years away (note to husband: experts are talking about mainstream adoption in terms of "years," not "decades") from being able to purchase our own driving robot. In the meantime, there are other technologies out there that promise increased roadway safety while we wait. For example, Volvo is working on vehicles that can connect to "platoons" on highways led by professional drivers. While the "engine" of these road-trains would be driven by a human, once wirelessly connected to the train, the rest of the drivers would just site back and enjoy the ride. Volvo suggests that their trains may be on the road in Europe as soon as 2020. Excuse me, while I go collect my $50.